After asking around, Bailey procured a contract for a grand total of $200 a month to sweep a parking lot. That was enough for him to go get his first sweeper, which was called a ‘Trailer Vac.’ As the name implies, this was a sweeper mounted onto a trailer, one of about six total of the sweeper units that a man working out of a storage locker in nearby Boulder City ended up ever making. It was the correct decision: In addition to the company’s very first sweeper, Bailey’s Sweeper Service now boasts a total fleet of a dozen units, with a crew of 25 employees to operate them as well as handle the other services the company now offers. Day porter and power washing services are two of the standard services the company performs for many of its business and Homeowners’ Association (HOA) clients. And John must have learned even more from the old guy who got him into sweeping; today, Bailey’s has a crew that washes windows. The majority of their units used for parking area sweeping are NiteHawks, though, mostly model 400s but with a couple low-profile 200s for parking garages. In addition, they have one sweeper from Victory Sweepers and several of Schwarze’s 348-I parking lot-class models. 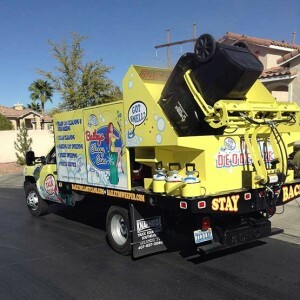 With the greater power the latter twin-engine sweepers offer, they are used for HOA and trailer park sweeping as well as other heavier debris removal duties. Loebig said they’ve found their client mix between parking lot nighttime route customers and HOA organization daytime sweeping to average out about the same number of hours per month. Of course there are more route customers, since HOAs tend to be larger scale projects; some of the big ones are rather like having periodic municipal street sweeping accounts. 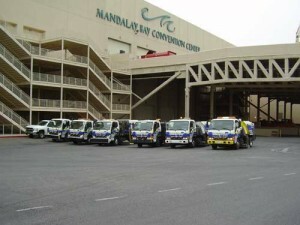 As may be seen in the accompanying photos, the Bailey management team does have a highly stylized wrap for the trucks, one that includes the shadow profile of the Las Vegas skyline. This ties the company in even further with its geographic area. 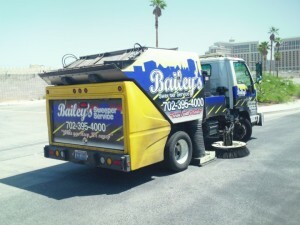 The company is clearly proud of what they do and are proud to emblazon the Bailey’s name and logotype on the equipment. “We do a good job, one that we’re proud of, and we want anyone to be able to find it easy to give us a call,” said Loebig. They’re also proud of the shape their equipment is kept in; they employ a full time mechanic to handle that task. He is also then on-hand to repair any damage that might occur to one of the sweepers, from bending a head on a manhole cover to any of the other myriad things that can occur with both daytime and nighttime sweeping. Cited as one of the other advantages Bailey’s Sweeping Service provides is being large enough — along with a management team that is committed to never interrupting service to a customer due to breakdowns — that they always have a backup sweeper available. The company also does a number of events each year, from racetrack cleanup to many of the seasonal marathons, including the Rock ‘n Roll Marathon since the first year it came out in 2007. 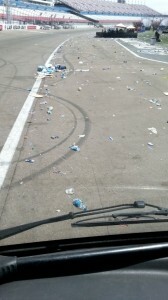 They’ve needed as many as 10 sweepers for some of the R&R Marathons and, in other years, as few as three. “We’ve refined our system through that time-span, and have done the same for many of the other events that we handle in Las Vegas each year. When the organizers work with us and everything goes smoothly, then they keep coming back to us year-after-year. That’s the kind of business we like and I’m proud that our reputation makes that happen,” said Bailey. The company does a significant amount of on-call sweeping in addition to its regularly scheduled work. 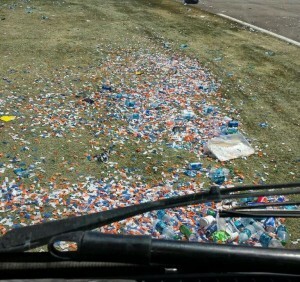 Bailey credits what they’ve learned through the years during their many large event cleanups to enabling their service team to be ready for anything that might be thrown at them. Part of this is that the company has a solid group of employees that handle day shift duties, and the same can be said for most of the night crew. Like most all parking area sweeping company owners, though, Bailey says it seems like management is always looking for a person or two for the night shift. “We’re sending people out in the middle of the night in our expensive vehicles and it’s difficult to get just the right people who can do that job and do it well. That said, I still have the very first employee that came to work here 23 years ago; my office manager is coming up on 20 years and we have a handful of guys who have been with us five, six, seven, eight years. I’m pretty proud of that,” Bailey enthused. 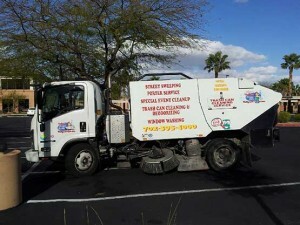 The sweepers are all outfitted with GPS units from Fleetmatics. Both members of the management team agreed about how well this works for such items as scheduling, maintenance and allowing solid cost accounting. They clearly get that the company is selling time, as well as sweeping and other services. “The Fleetmatics software lets us be on the level of pennies instead of dollars; seconds instead of minutes, if that’s what we want to do,” said Loebig. “We want to be able to know our exact cost of service and of keeping a particular sweeper in operation. The only way to be able to do that is with statistics like we are able to capture in the Fleetmatics program. On the accompanying podcast, starting at about the 14th minute, we include an exchange on how Bailey’s approaches and works with its HOA clients. Although there are some tidbits of information, it should be noted that all HOAs in the Las Vegas area have gone to sealed bids for sweeping. Bid requests are often sent out only to the companies that have been selected as qualifying for the contract. That makes it doubly important to be visible, as well as to have a good understanding of the firm’s cost of operation so that bids will be competitive. Fortunately, says Bailey, because they’ve worked with so many of the managers in the area they typically include the company when the requests for bids are sent out. “Although low bid is a strong factor, the HOAs also want experience, longevity and, oftentimes, a reference list. It’s a market segment where a good reputation and how long you’ve been in business counts,” said Loebig. “However, (said with a chuckle) we’ve also seen situations where someone got one of these bids and they didn’t even have a sweeper. 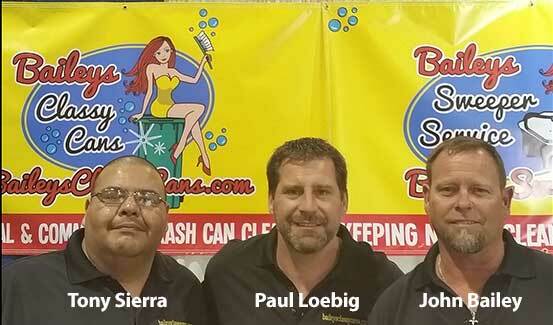 Instead of just selling sweeping services, Bailey’s Sweeping’s sales manager, Tony Sierra, typically offers a whole package of services to customers. These include the services of power washing, window washing and porter services. Many clients like using Bailey’s for as many services as possible, since they know and trust the company after so many years. This service revolves around a machine they purchased that can clean two recycling or garbage containers at once. The containers are sprayed down automatically with heated water at 4,000 psi and then turned over and spritzed with a disinfectant/deodorant. We can do a quick rubdown with a brush on the outside and the can, they say, comes out looking as good as new. “It gets over 100-degrees here in the desert,” said Loebig, “and a garbage can will start having a bad odor pretty rapidly. Plus, many of the HOAs will not allow the containers to be left outside. Combining that information with the fact that we already work with many of the HOAs in the area and we think it will be a good additional business for us.” To hear more, that particular conversation starts about minute 28 on the accompanying audio podcast. Following that, the interview discusses the basic service programs HOAs request and/or require. With the company’s recent expansion into yet another service, the brightening economy and having already experienced an excellent start to the year, Bailey’s management gurus expect to have a great year in 2015. And, as you can tell by their positive, customer-oriented approach to business, there’s no need to be looking back. 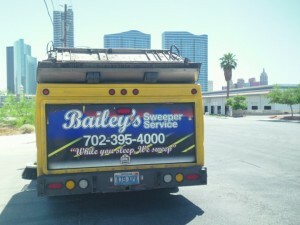 For more information about Bailey’s Sweeping Service, Inc., be sure to visit the company’s website, located at www.BaileysSweeper.com.